Whenever I am feeling down, I'd like to bake myself a very big cake to eat. I am a diehard cake lover. I have been in a dilemma for a long time if I should bake a Chocolate cake for my kids or a Marble Cake (my favourite) and if I bake a big HappyCall Pan (HCP) size of Chocolate cake, I am only seeking trouble for myself. My kids are very prone to mouth ulcers and sore throats... Finally I found a solution: I shall bake a 2-in-1 cake! How about I divide the HCP into 2, like those "Yuan Yang" Hot pot? 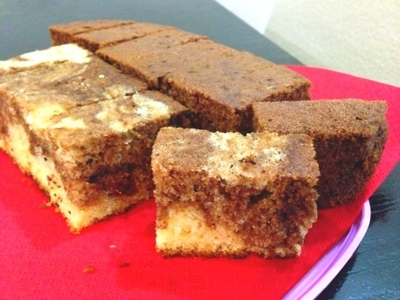 After all, Marble Cake and Chocolate Cake share almost the same recipe! 10. Smooth the top of both cake batters and bake it on medium stove-head on medium-low fire. 11. 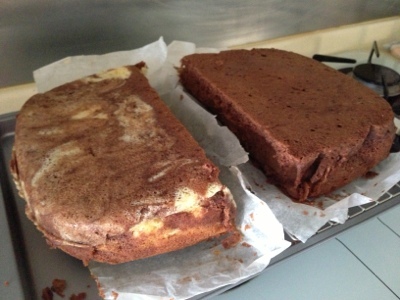 Bake for 20-25 mins, shifting the HCP from sides to sides to evenly bake both the cakes. 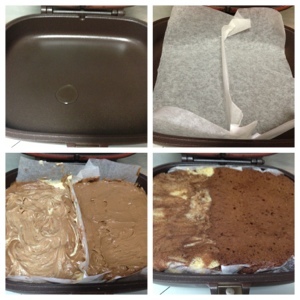 On the last 5 mins, flip the HCP to bake the top of the cake, shift to all 4 sides to create an even brown top.